As I mentioned in my latest European post about Venice and Florence, we traveled from Venice to Rome and for the first time on our trip, spent two nights in one city. Our entire trip was very busy and we were constantly on the go, so being able to unpack a bit and spend additional time in one city was something we were really looking forward to. 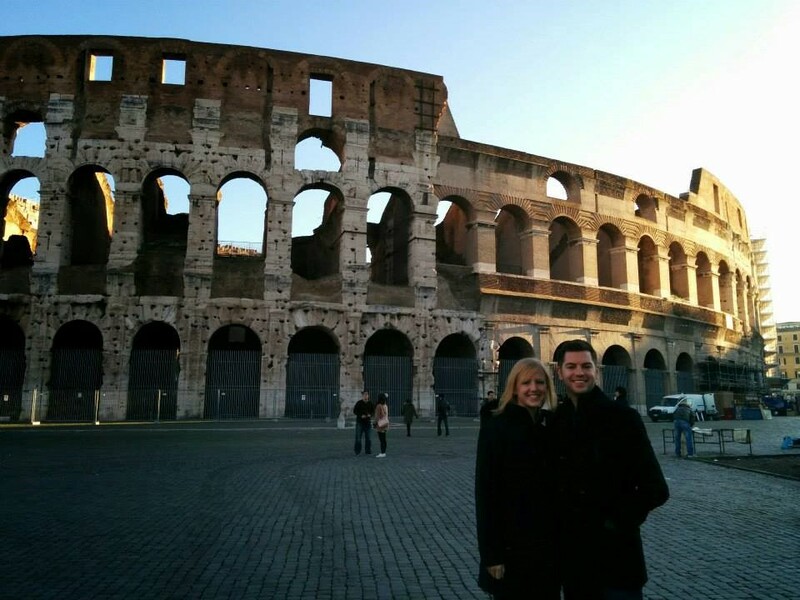 I also mentioned last time that of all the countries we were visiting, I was most excited for Italy, and Rome was definitely a highlight of our trip. 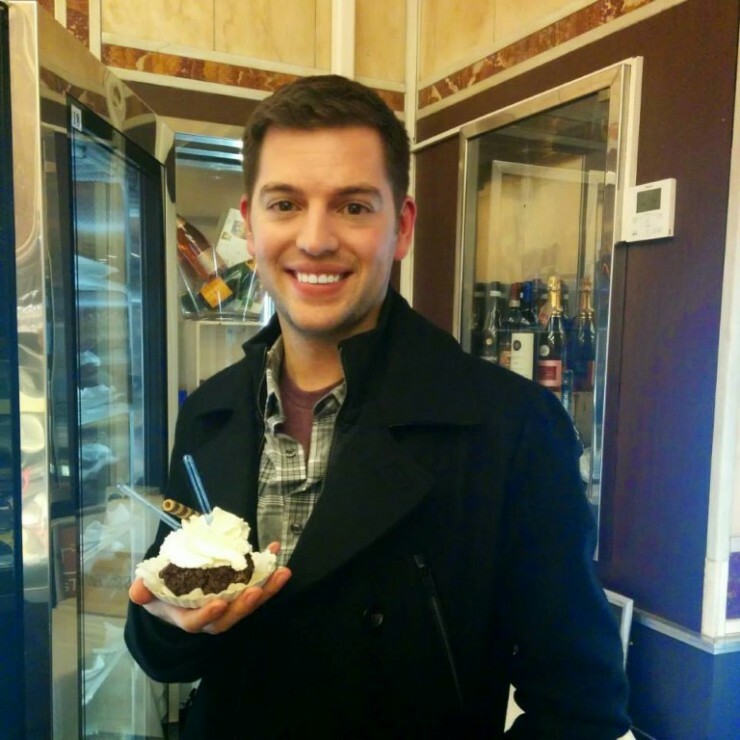 Throughout Italy, I splurged on espresso, wine and gelato (you know, the important things). 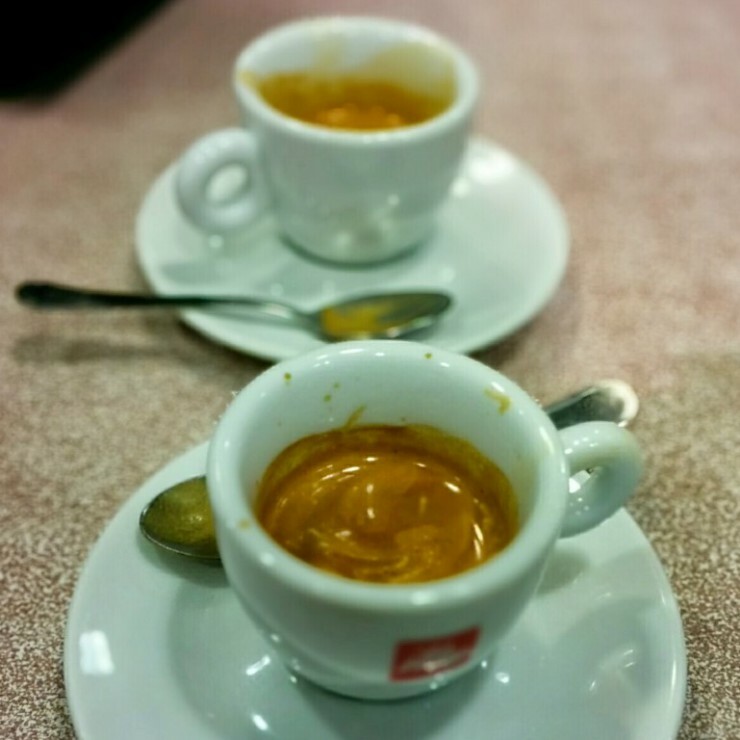 I believe the espresso below was from a stop along the motorway. Have I mentioned that I wish gas stations in the States had better coffee?! 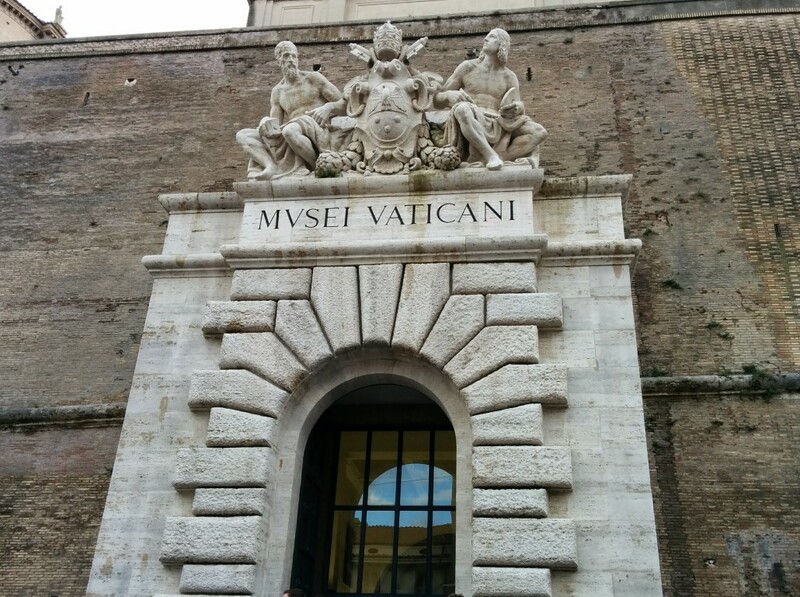 As soon as we arrived, we went straight to Vatican City to see the Sistine Chapel and the Vatican Museums. 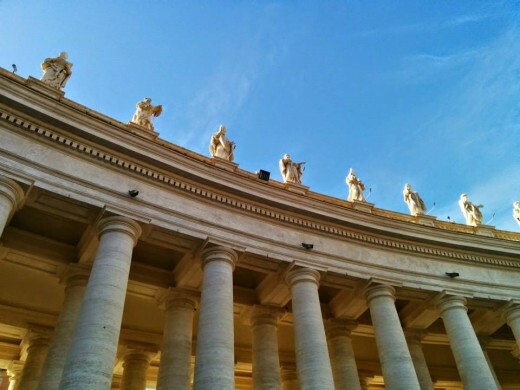 Our tour director, Emile, set up a local guide to accompany us on our excursions in Rome and provide us with a plethora of knowledge and information about Rome. 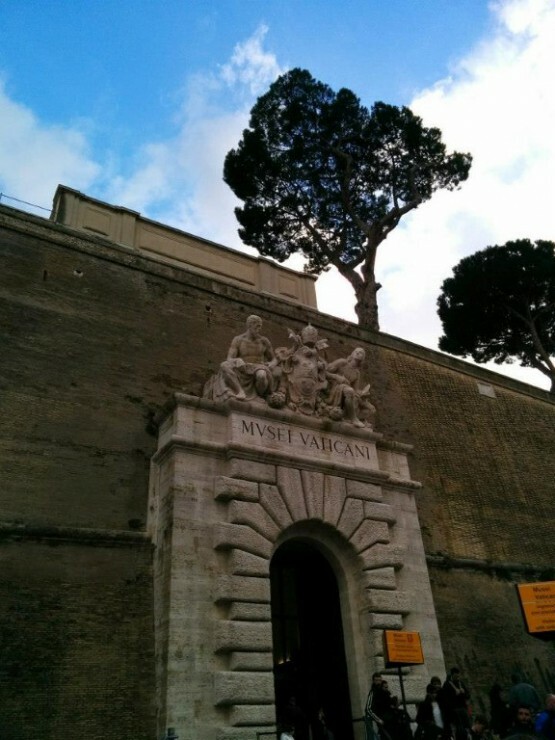 We met outside the entrance to Vatican City, then entered the city through this magnificent archway. 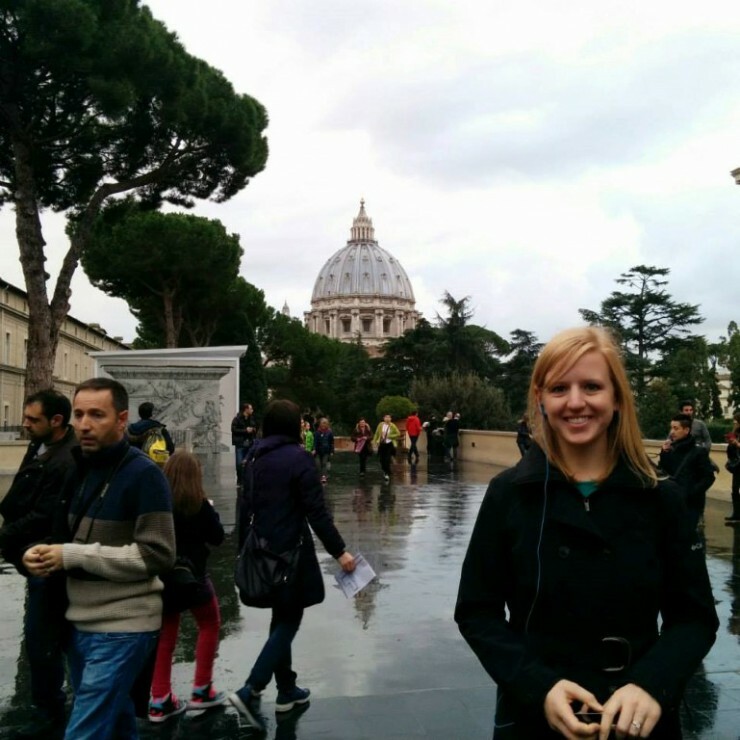 We immediately got a glimpse of St. Peter’s Basilica and were able to sneak a few pictures during a break in the rain. 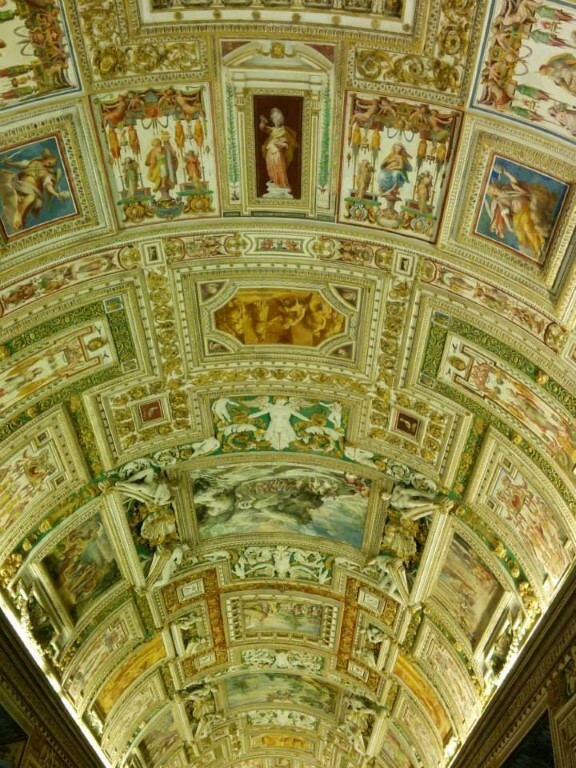 Our local guide escorted us through some of the Vatican Museums, including the Tapestry Gallery and the Gallery of Maps. 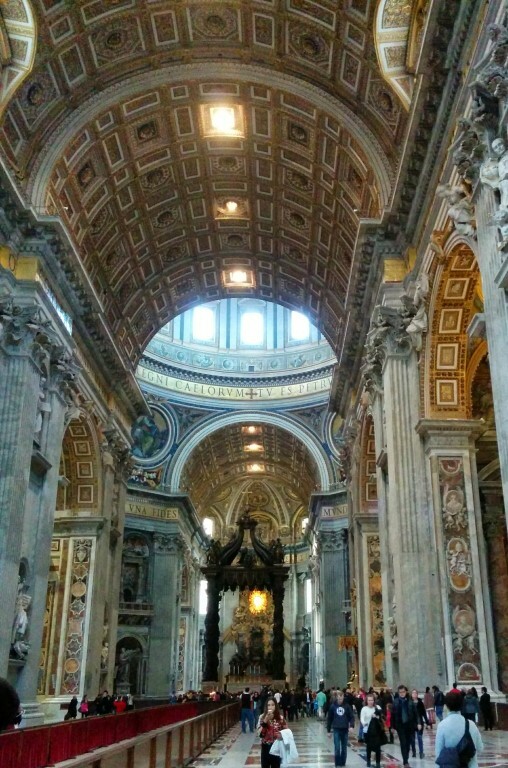 She pointed out numerous paintings, tapestries and artifacts that reside within the Vatican. One thing I really enjoyed seeing was the unique architecture and intricacies of the ceilings throughout all of the hallways. We arrived at the Sistine Chapel and were strictly informed we could not use phones or take any photos inside. I’d seen pictures of the famous Michelangelo painting on the ceiling of the chapel, but I don’t think I fully appreciated it until I was standing in that room, gazing upwards in awe. 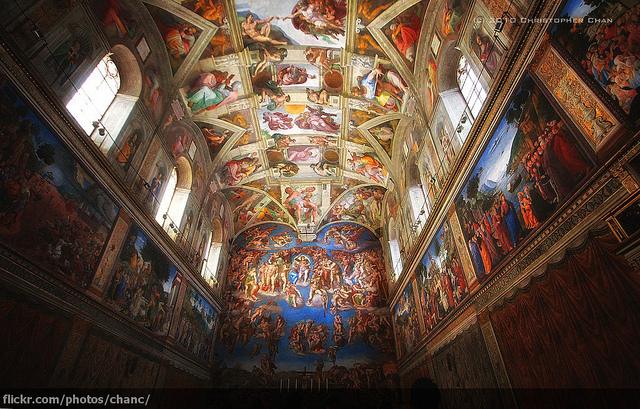 It’s hard to believe that one man painted this incredible work of art over 500 years ago. The chapel itself was much smaller than I imagined, and although I felt like it was very packed with people, we were told that the crowds were much smaller than usual. We stayed inside for about 30 minutes, just observing and taking in the unique atmosphere. We regrouped outside the chapel, exited Vatican City and continued our adventure in Rome with a night-time walking tour of the city. 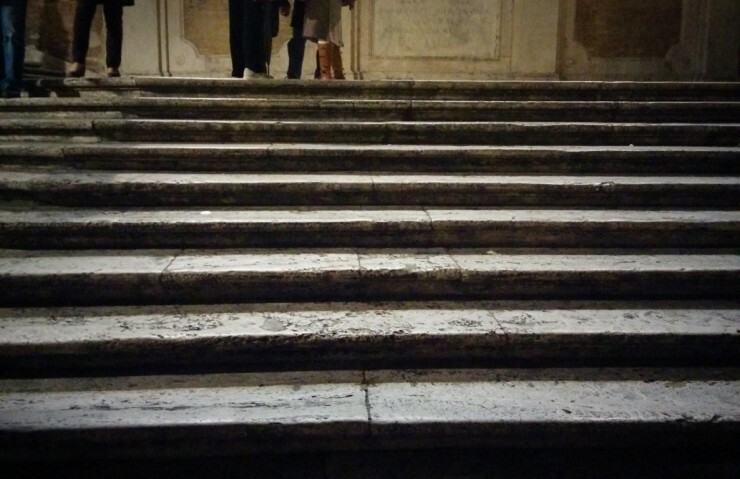 Our local guide first brought us to the Spanish Steps, a historic stairway built in the early 1700’s that connects Piazza di Spagna at the base and Piazza Trinita dei Monti (near the Trinita dei Monti church) at the top. 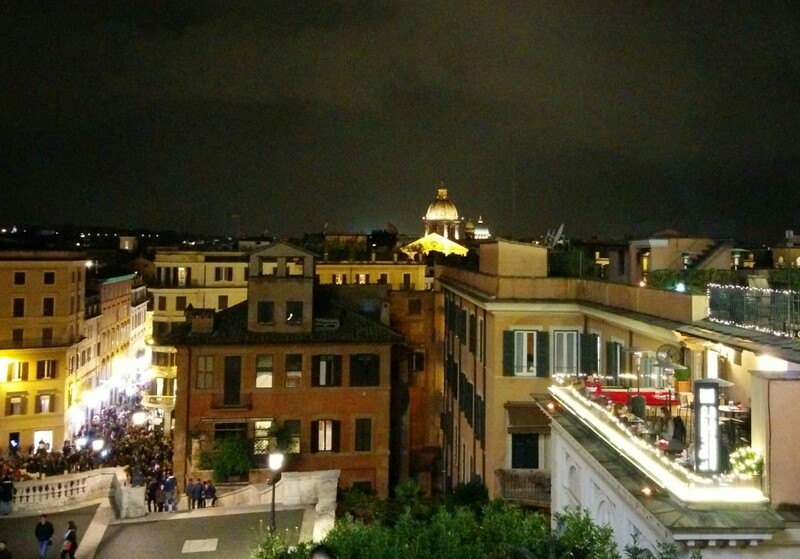 Before descending into Piazza di Spagna we enjoyed an excellent view of the city and St. Peter’s Basilica. We also saw the first of many obelisks in the Piazza. 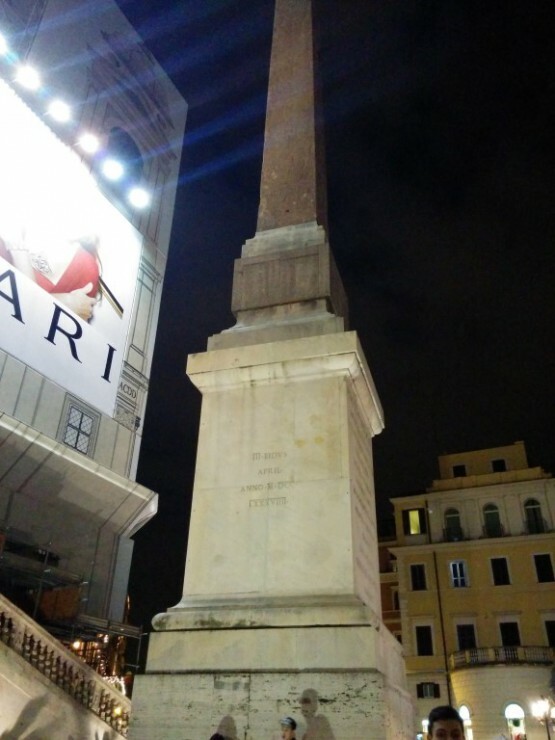 Obelisks were brought to Rome by Roman Emperors from Egypt, symbolizing victorious conquests and power. 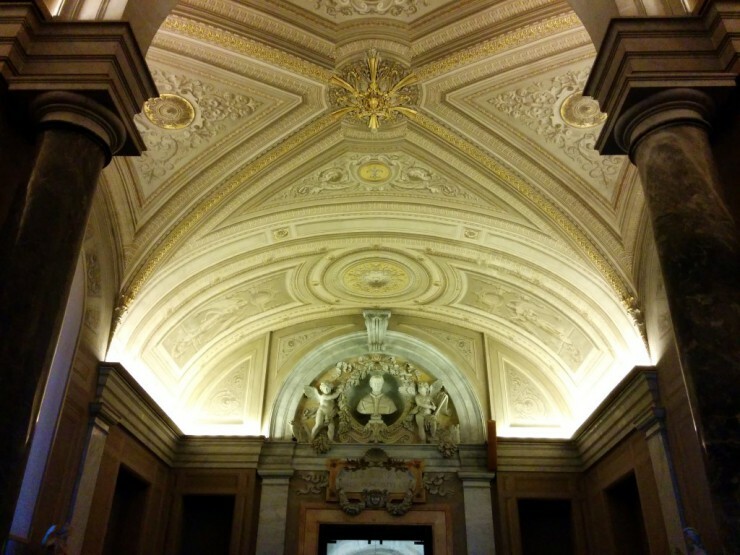 We walked through the central part of Rome, through a popular shopping district and stopped at Santa Maria Maddalena, which I recognized from the movie, Angels and Demons. 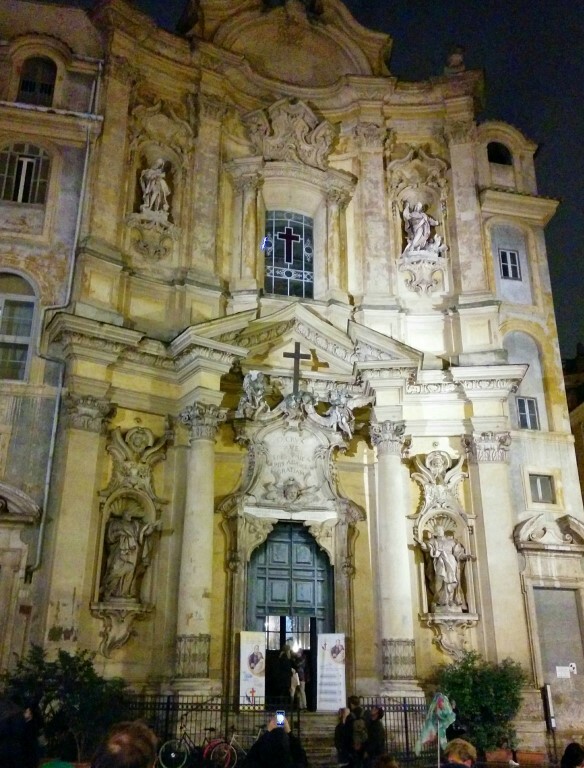 This Catholic church was named after Saint Mary Magdalene and is located on the Via della Maddalena. 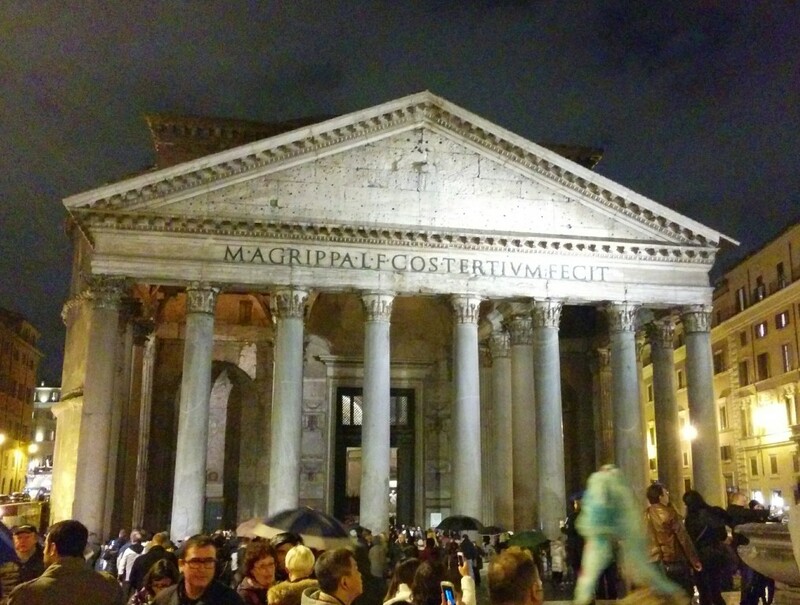 We then made our way to the Pantheon near the Piazza della Rotonda. 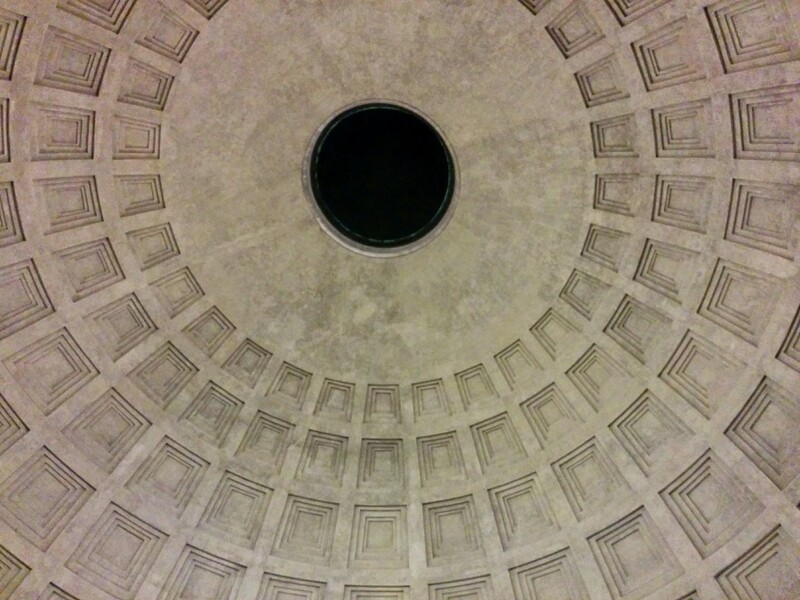 The Pantheon is one of the best, if not the best, preserved ancient Roman buildings. It was built by the Emperor Hadrian almost 2000 years ago, between 118 and 125 AD. The original purpose of the building is somewhat unknown, but it was classified as a temple. It was officially converted to a church in the year 608 AD and has been used as church ever since. We went inside and observed the incredible architecture. The building has seven alcoves within its interior and most notably, an oculus at the center of the large concrete dome. The oculus opens to outside and is the main source of natural light. 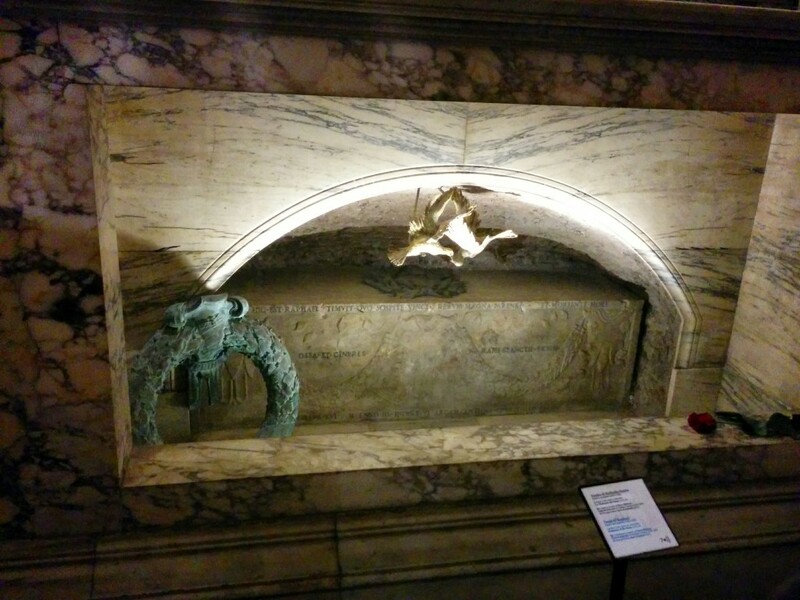 Since the Renaissance, the Pantheon has also been used as a tomb. 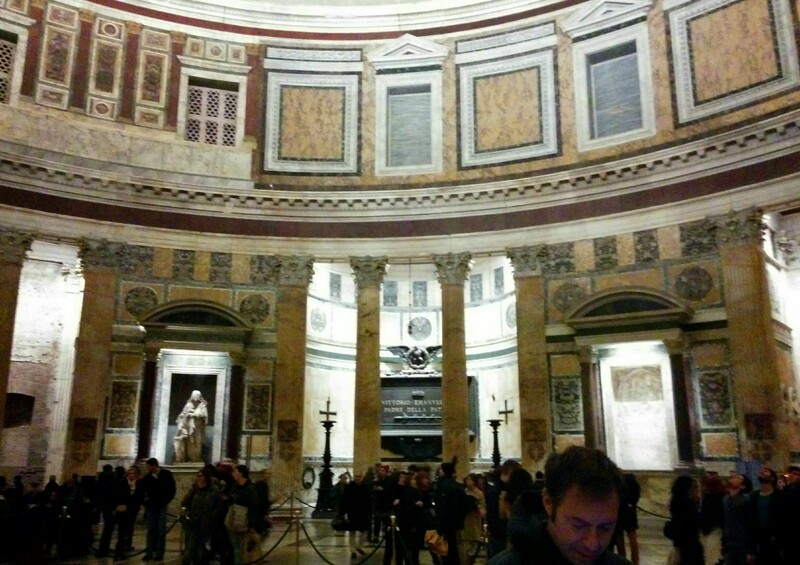 Raphael, the famous Italian painter of the Renaissance, is one of several people buried at the Pantheon, and we were able to see his tomb. We walked from the Pantheon to the Piazza Navona, where another big scene from Angels and Demons was filmed. 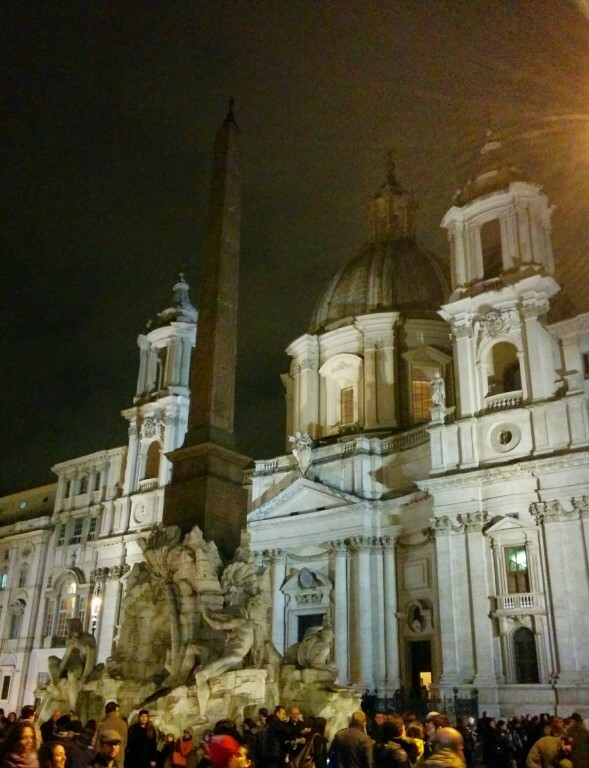 We observed another obelisk and the Fontana dei Quattro Fiumi, also known as the Fountain of the Four Rivers. We met up with our tour director and he informed us of our dinner options for the evening. Evan and I were both beyond hungry at this point and we followed him to a local pizza place. 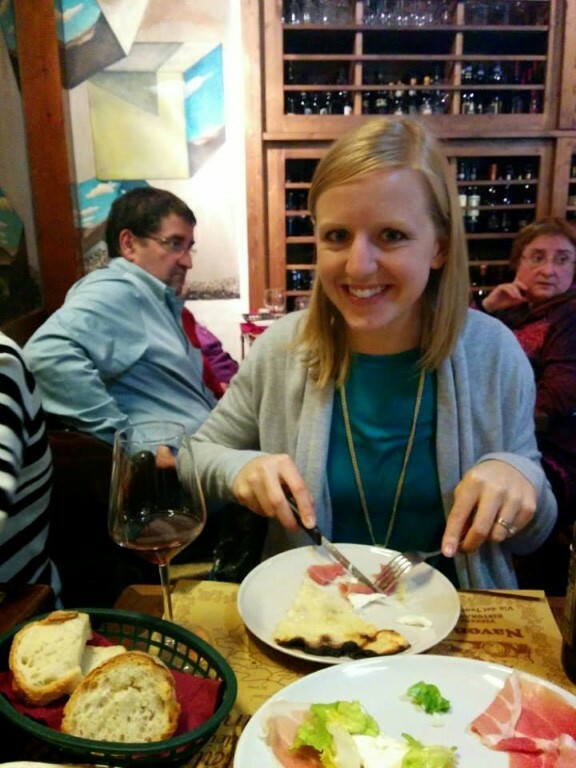 We ordered a delicious appetizer of mozzarella cheese and prosciutto, then shared an Italian-style cheese pizza. And of course, we enjoyed some wonderful Italian red wine. Emile also highly recommended a dessert place called Caffe Domiziano near Piazza Navona, so we splurged and enjoyed a treat. Evan had the tartufo al cioccolato, a decadent chocolate truffle that I believe was served with gelato. I was not so adventurous and just ordered gelato; it was still delicious though! 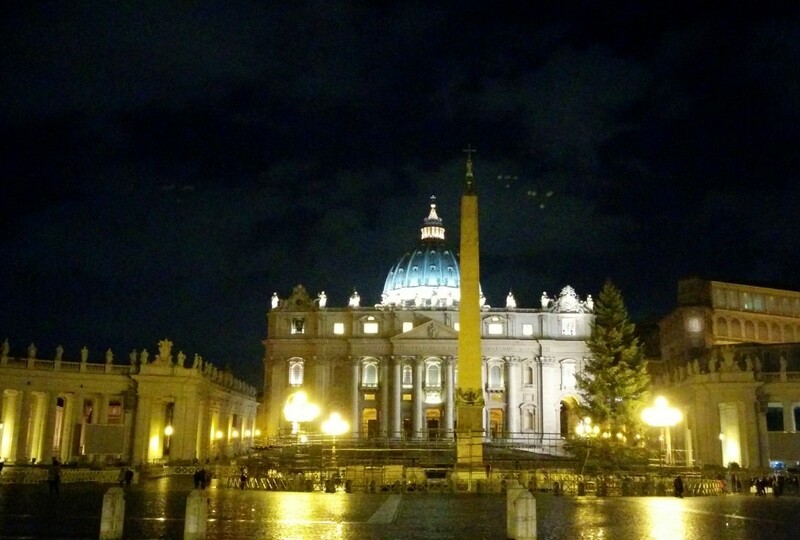 On our way to the hotel, Executive Style, we stopped outside St. Peter’s Basilica, which was beautifully lit up. We enjoyed a crowd-free, unobstructed view of the church, which I’m guessing happens infrequently. 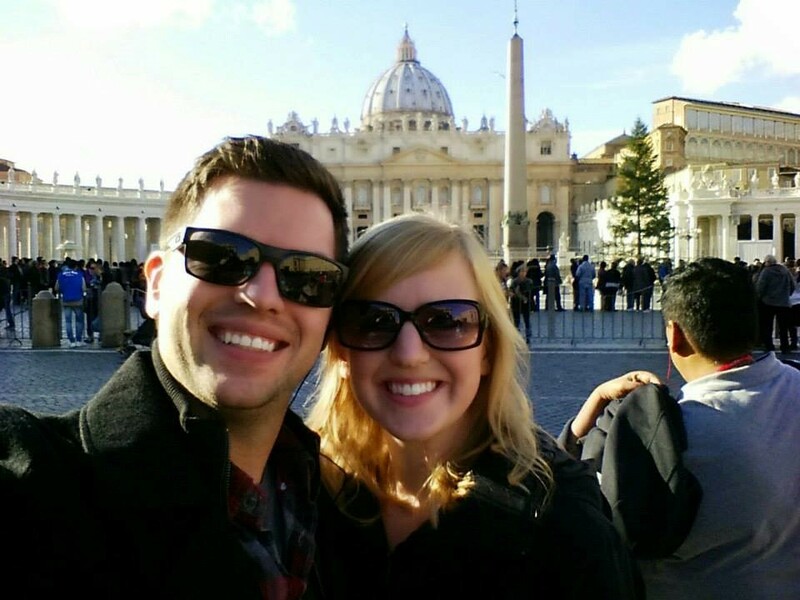 The next morning, we went back to Vatican City to see the Pope and tour St. Peter’s Basilica. This was one of many occasions during our time in Europe when Evan and I were both incredibly glad we booked this trip with Trafalgar; I guarantee we would have never seen the Pope if we were traveling alone. 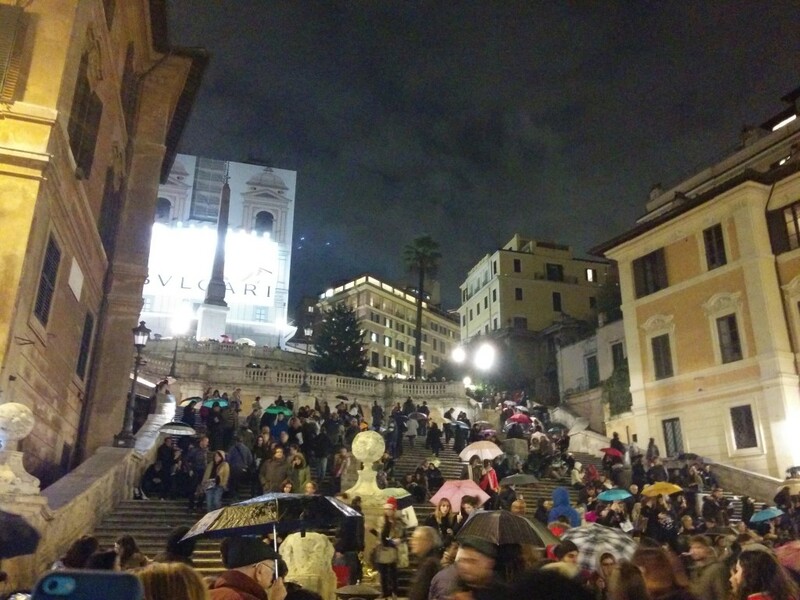 We arrived at the Basilica and were instantly engulfed in a crowd of people. It was a very different experience from the night before. 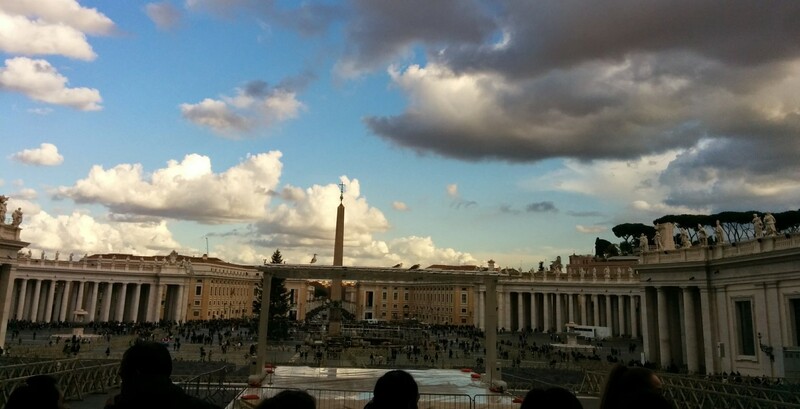 We arrived early enough to get a good view, but didn’t need to wait long to hear the Pope. 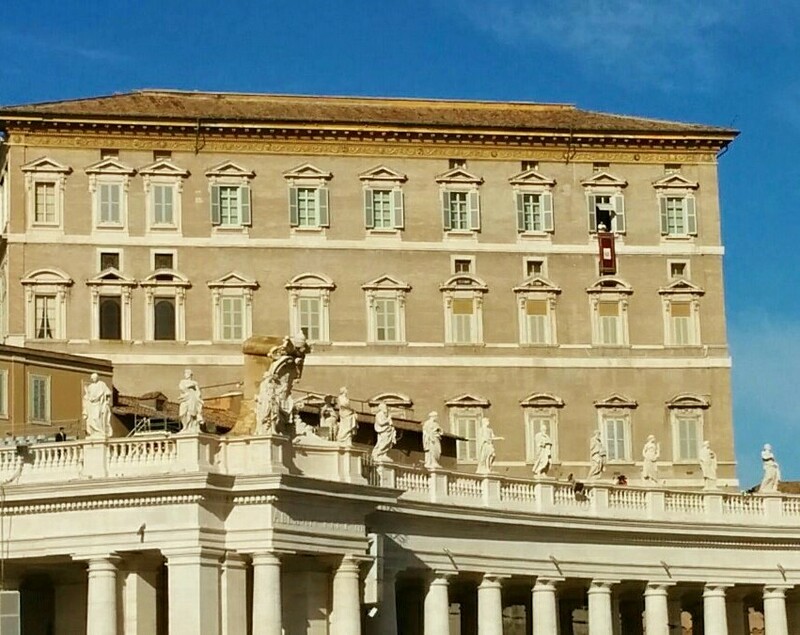 About ten minutes prior to the Pope’s appearance, a red banner was hung from the second to the right window of the Apostolic Palace. Then the Pope appeared and began addressing the crowd in Italian (I believe). We were told he gave a short speech, said the Angelus prayer and ended with a blessing. It lasted about 20 minutes, then he waved to the crowd and went back inside. Although we couldn’t understand the language, I’m so glad we could experience this. The crowds quickly dissipated and many people started lining up for tours of the Basilica. We had a little time to kill before our tour, so Evan and I went to the Vatican gift shop to purchase some gifts for family members, then stopped at a nearby café for a bite to eat and a cappuccino. While the food was pretty forgettable, the cappuccino was far the best one of the trip! The barista insisted on perfecting the heart on top of mine and made the drink twice. 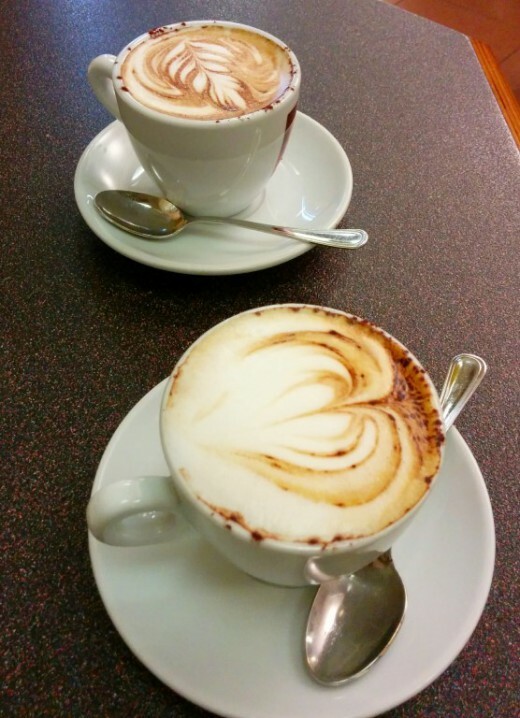 Just seeing this picture of the cappuccino makes me want to go back and order another one! We met up with our group again and got in line for our tour of the Basilica. 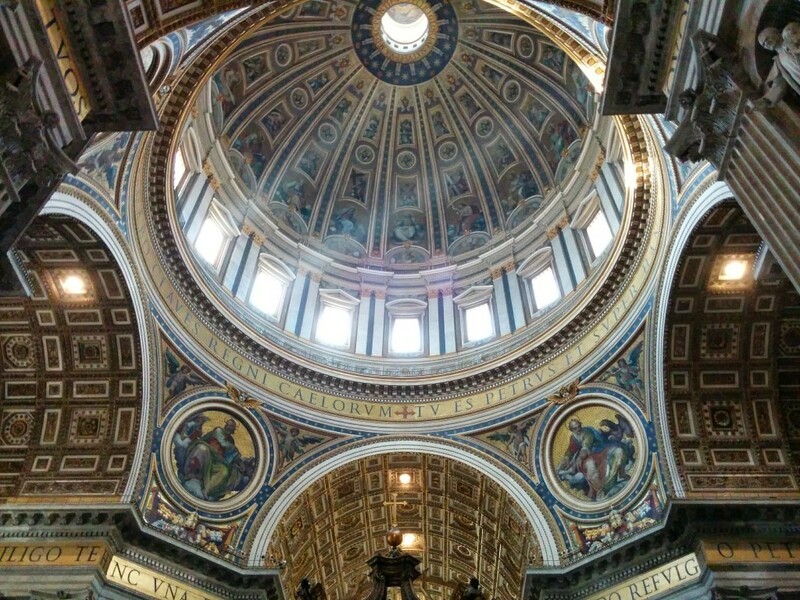 In case you are curious, St. Peter’s Basilica was constructed in the 1600’s and is one largest churches in the world. 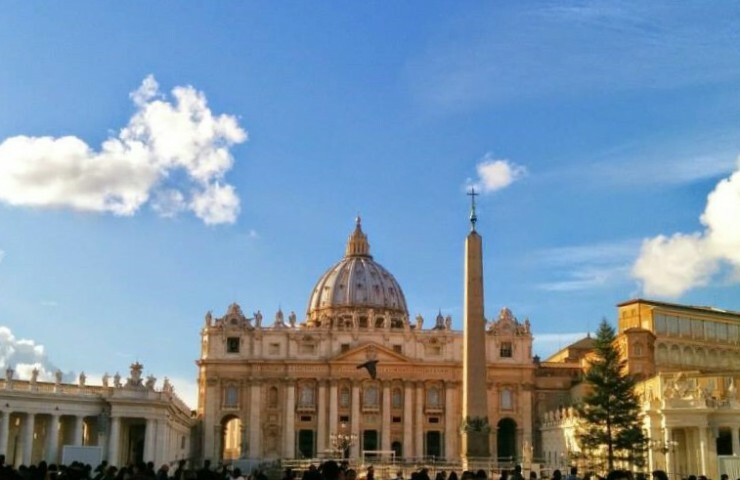 It was designed by Donato Bramante, Michelangelo, Carlo Maderno and Gian Lorenzo Bernini, and it probably one of the most renowned works of architecture from the Renaissance. I don’t know if I can put into words how incredible this building is. When I walked inside, I think the first word that came to my mind, besides wow, was perspective. Standing inside this massive, historical building, I instantly felt so small. I began to ponder how many people have also experienced what I was experiencing: from now famous artists to religious leaders to unmeasurable amounts of tourists. Honestly, it was a very humbling experience. I could have spent hours in here, analyzing every intricate detail that covered the walls and ceilings, the paintings and carvings on every inch of structure. It was truly incredible. There were numerous sculptures and pieces of art dedicated to noteworthy people of the religion throughout the building. 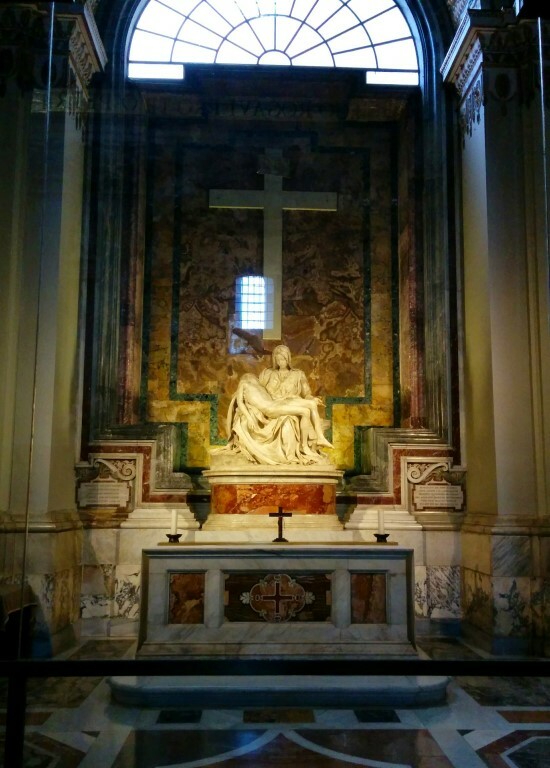 The Basilica is also the home to the tomb of Pope John Paul III and the Pieta, a famous Michelangelo sculpture of Mary holding a deceased Jesus. The Pieta was damaged in 1972 by a man wielding a hammer; it’s hard to tell from the photo, but it now resides behind glass. 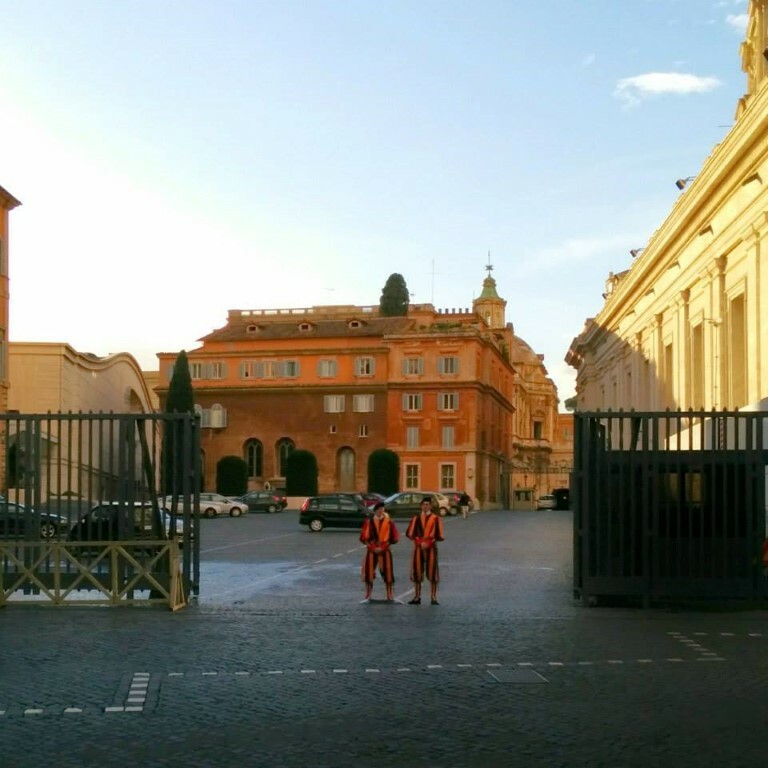 As we exited the Basilica, we noticed the Swiss Guard nearby and captured a quick photo. 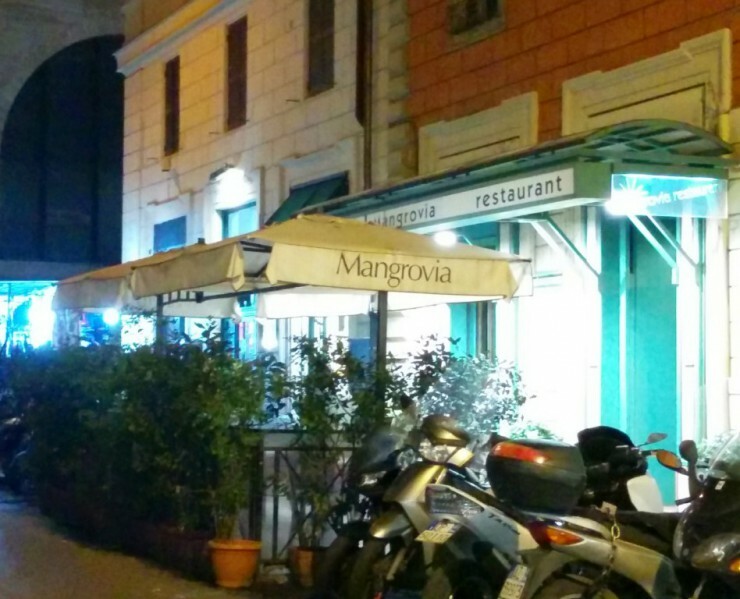 That evening we joined our group at a restaurant called Mangrovia for a night filled with great Italian food, wine and entertainment. 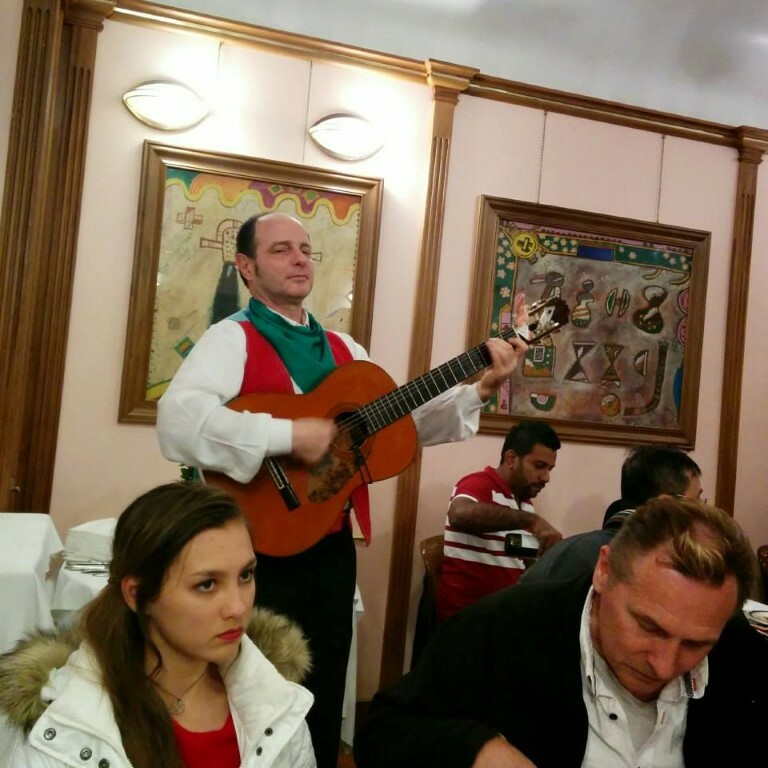 We enjoyed a multi-course meal (the highlight probably being the incredible homemade ravioli), and were frequently serenaded by a group of Italian men donning guitars and excellent voices. I think our entire group had a lot of fun. Our bus ride home turned into a mini party bus with dance music and strobe lights. The next morning, we packed our bags and boarded the bus bright and early. We had a full day ahead of us: one last stop in Rome at the Colosseum, a bus ride to Florence, then our first day of exploring the new city. On our drive to the Colosseum, we observed several unique buildings from the window. I love this picture below because it captures the beautiful cypress trees. 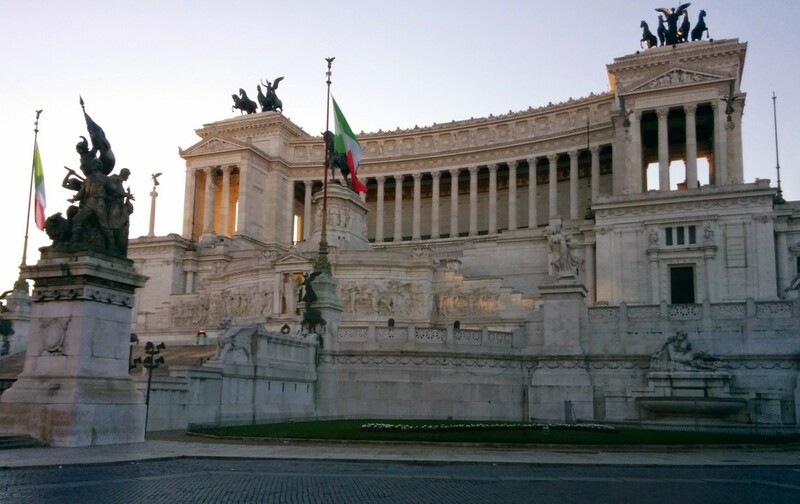 We drove past the Monumento a Vittorio Emanuele II, also known as the National Monument to Victor Emmanuel II. This building was built in the early 1900’s in honor of Victor Emmanuel II, the first king of Italy, and it now houses the Italian Unification museum. 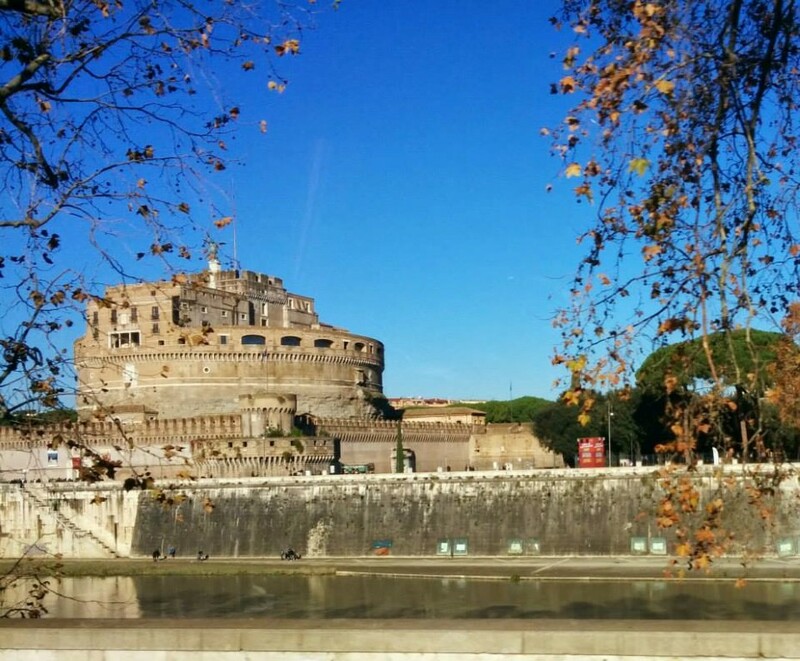 We also saw Castel Sant’Angelo, which was built around 130 AD and was originally used as a mausoleum. 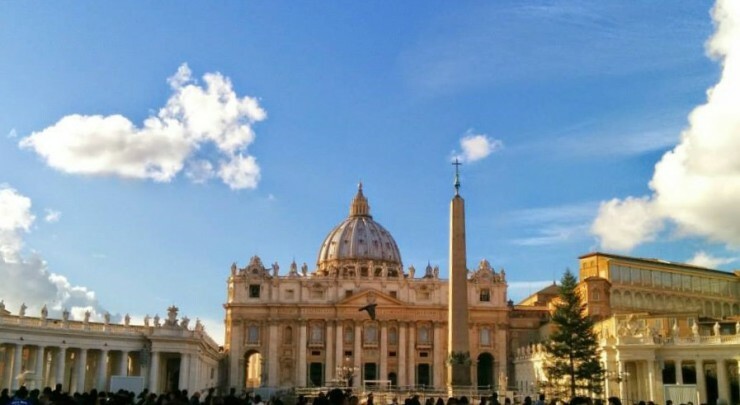 Around the 14th century, it served as a castle and place of refuge for the Vatican popes, accessible from St. Peter’s Basilica by a tunnel. The building is now used as a museum. About 30 minutes later, we arrived at the Colosseum. We met our local guide one last time and she led us on a tour of this amazing place. It’s hard to appreciate the scale of this place without stepping foot inside and experiencing it. 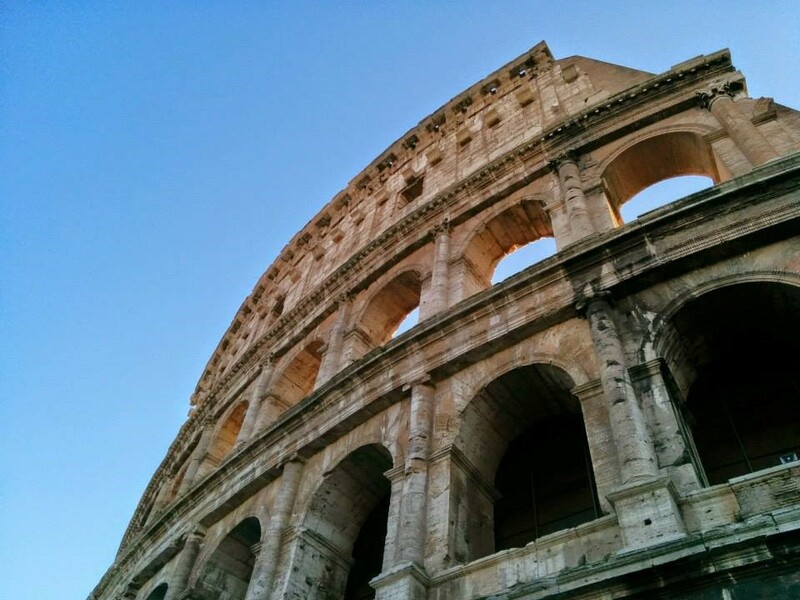 Construction on the Colosseum began in about 70 AD; it was commissioned by Emperor Vespasian and when construction was complete in 80 AD, just ten years later, the Colosseum was opened by his son, Titus. The one thing I kept wondering was how did they build this without any modern day construction equipment in only ten years?! The Colosseum, built of concrete and stone, was an amphitheater, intended to host gladiator combats and wild animal fights, for an audience of 50,000 to 80,000 people. People were seated in a tiered arrangement based on class and social rank. 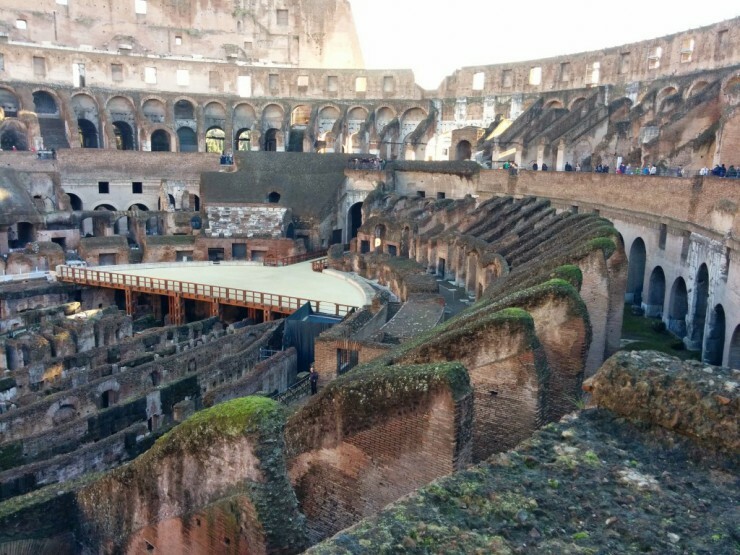 The Colosseum had a wooden floor that was covered in sand and served as the battleground. You can see the partial recreation of that floor in the photo below. Underneath the wooden floor was an underground structure of tunnels and cages where gladiators and animals were held before the games began. This is also visible in the photo. 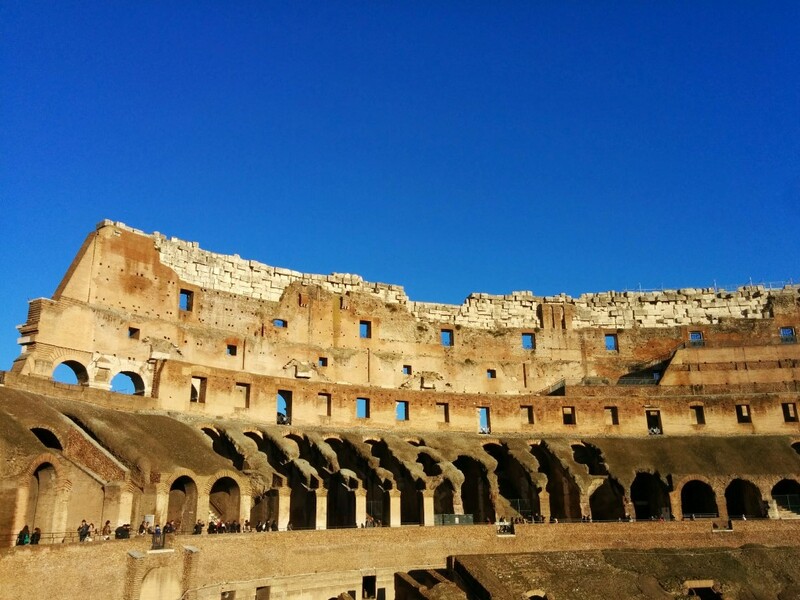 The Colosseum was in use for 4 centuries, but it eventually started deteriorating. 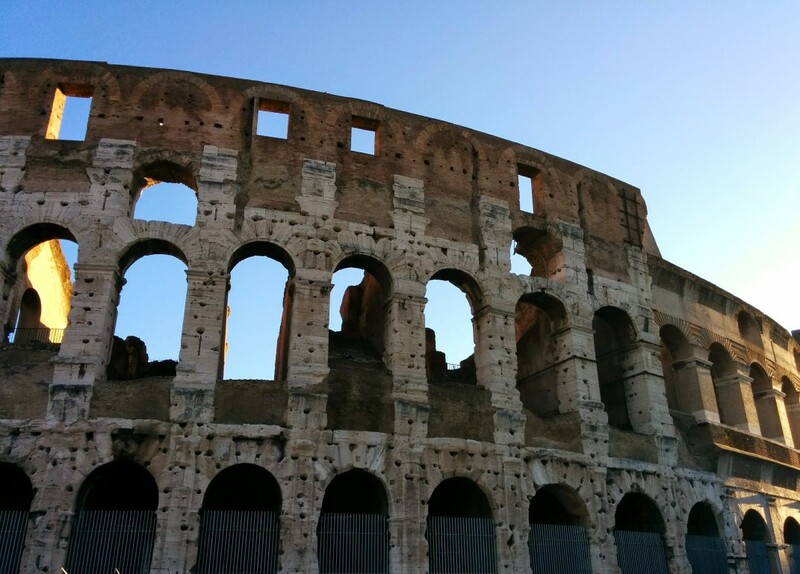 By the 1900’s, almost 2/3 of the Colosseum had been destroyed, but restoration efforts have been in progress to ensure this building remains intact as a piece of history. 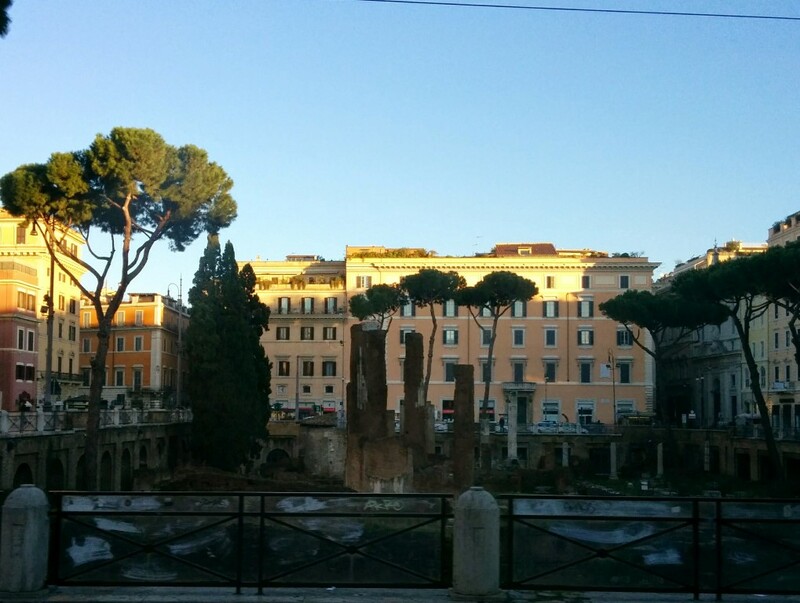 Of all the places we visited so far on this trip, Rome was definitely at the top of my list. Although we only spent just over 2 days there, we saw so much in such a limited time. I think you could easily spend weeks and months visiting this city, seeing and experiencing new things every day. I would love to go back and visit again someday. 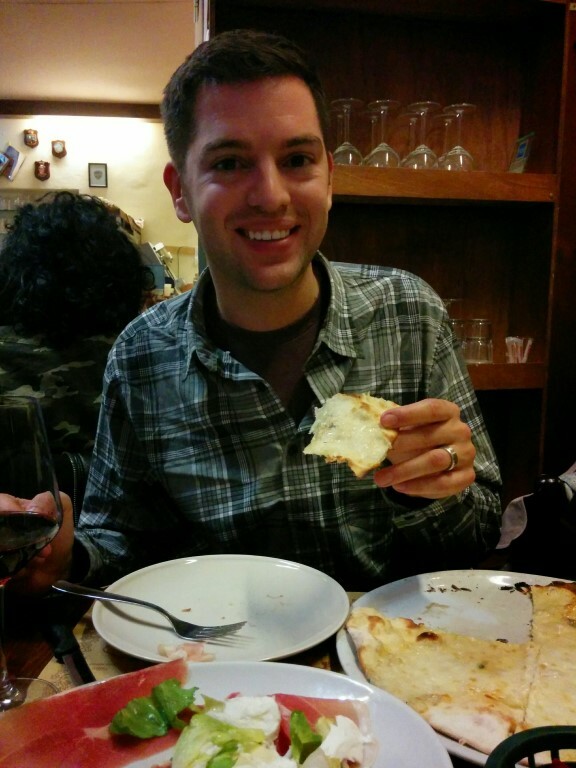 From Rome, Evan and I traveled to Florence. 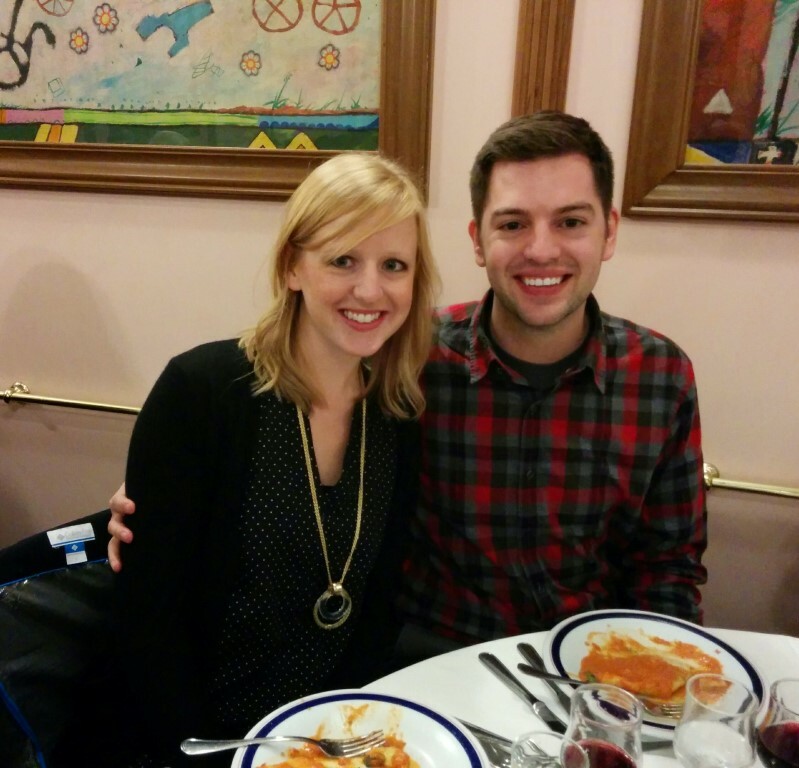 I talked about our adventures in Florence, along with Venice, in my last post. If you’re interested in checking out more about our European adventure, visit my posts on London, Belgium and the Netherlands, and Germany and Austria. And check back soon as we continue our whirlwind of a tour in Lucerne, Switzerland!